Do you enjoy dining al fresco but tire of transporting plates, utensils, serving dishes, wine glasses, water glasses, etc., between your indoor kitchen and your outdoor dining area? An area devoted to outdoor food preparation and storage can make outdoor entertaining more of a pleasure and less of a chore. Lifestyle, space constraints, access, and budget, as well as the practicality of providing water and electricity to the site, should be considered before adding an outdoor kitchen. Outdoor cooking and dining are often relatively casual affairs. If your style tends toward the formal, or if mosquitos and spiders drive you indoors, you might prefer cooking and dining within the comfort of your home. If outdoor cooking and dining appeal to you, do you have the space for what you want to do? Perhaps you have room for a food garden or for a food preparation area, but not for both. Or maybe you can have both, but they will have to be scaled down. If you grow vegetables, a sink to wash them, a counter to prepare them, and a grill to transform them into savory fare might be all you need. If your interior kitchen is adjacent to your outdoor dining area, you might not need an outdoor kitchen after all--a pass-through between your current kitchen and your outdoor dining area could add flow between indoor and outdoor rooms. Access is undoubtedly an issue at this Sammamish property. I count ten stairs between the house and the kitchen unit, which has a built-in barbecue, sink, refrigerator, and counter space. Having these elements outdoors, near where you dine and entertain and surrounded by a lush garden and waterfall, eliminates some of the tedious back-and-forth trips between the house and the outdoor living area. Many homeowners appreciate outdoor living, but a built-in kitchen with high-end appliances is a big-ticket item, easily reaching $100,000 or more. Scaling your sights to what is essential, however, might bring your project within reach. Indoor kitchens generally have at least a stove, oven, refrigerator, and counter and storage areas. Other typical components include a microwave and dishwasher. Because an indoor kitchen can provide a backup to an outdoor kitchen, outdoor kitchens can have fewer components, or even relatively frivolous ones, as you need not duplicate everything that’s in your indoor kitchen. The only “kitchen” components at this property in the Denny Blaine neighborhood of Seattle are a wood-fired pizza oven, barbecue, and stainless steel food preparation and storage table, but landscape architect Tim King contends his clients throw “a great party with just those elements!”—and he has the pictures to prove it. The designers expanded the hardscaping and added a cantilevered ipe deck with built-in benches. When combined, two six-foot-long rectangular tables create one square or one long table, enabling the homeowners to entertain 40 or more in a small area. Strings of lights overhead add to the magic on summer nights. This outdoor kitchen in Medina has it all—or almost. Once you’ve created an exquisite garden, what do you do with the pickle ball court? In this case, the existing ball court was a fortuitous inheritance; otherwise, the area would have been planted before the energetic gardener living there realized it might be nice to relax once in a while and enjoy the fruit of her labor. The covered kitchen area has a concrete counter with sink, storage, and Viking appliances. The concrete of the pickle ball court has been stained a marbled burnt orange, and runnels cut into it add interest as well as drainage. The court area offers several dining options, including a covered one, and a linear gas fire pit completes this dream setting. 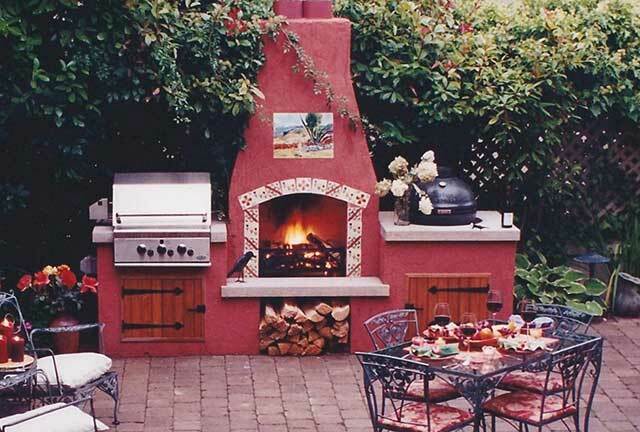 Given the 68 paces and 21 stairs between the indoor and outdoor kitchens, the outdoor kitchen was not merely a luxury but almost a necessity for a fabulous garden that hosts many large functions. Image courtesy of Environmental Construction, Inc.
A roof can protect your outdoor kitchen from rain and snow, tree litter, and bird droppings. In this Bellevue, WA, kitchen, an arbor attached to the house is covered with clear polycarbonate plastic, which allows light in while protecting the kitchen from outdoor elements. The linear kitchen, which includes a barbecue cabinet with gas grill, refrigerator, and storage drawers, was built in front of an existing concrete retaining wall. The countertop is sealed Bluestone, and the same veneer stone was used throughout. A gas fireplace encourages relaxation and provides warmth year-round. Old Mexico.—The kitchen area of this property in the View Ridge neighborhood of Seattle reflects the style of the home. A counter with a built-in gas grill, smoker, and storage cupboards is bisected by a wood-burning fireplace and firewood storage alcove. The deep rose color of the stucco, the hand-painted tiles from Mexico, and the heat from the fireplace contribute to making this small gem both warm and inviting. Pool-side casual.—At the far end of the swimming pool of this Bainbridge Island property is a stone kitchen area housing a refrigerator, built-in barbecue with storage, and combination trash and recycling unit that facilitates outdoor dining and entertaining. Where better than an expansive pool deck to enjoy your guests, or to just relax? Contemporary cool.—Why, you might wonder, would an article on outdoor kitchens in Seattle feature a property in Tucson, AZ? Every feature in the small side yard of this in-city townhome is easily translatable to Seattle, which boasts longer days and less summer rainfall than Tucson. The sunken patio area has seemingly miles of concrete counters. When filled with ice, the deep concrete sink can be stocked with cold beverages. Vegetables grown on site are cooked on a built-in grill. A hip yet cozy seating area surrounds a fire pit; when a top is added the fire pit becomes a coffee table. Square tables provide seating for dining. Ingenuity and good design have transformed a barren plot into a functional masterpiece. 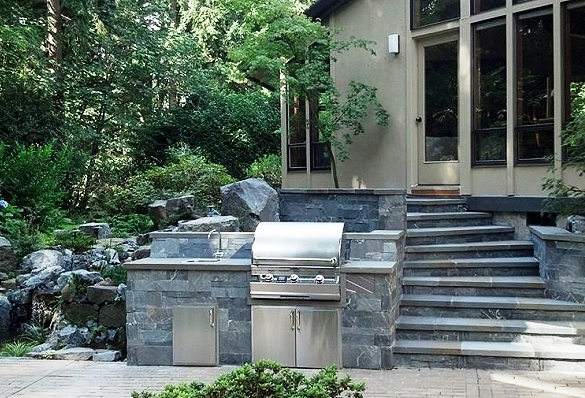 Adding kitchen components to your landscape is an excellent way to enhance your outdoor living experience. Landscape designers can help you assess issues related to priorities, placement, and access, and can tailor the project to your budget. 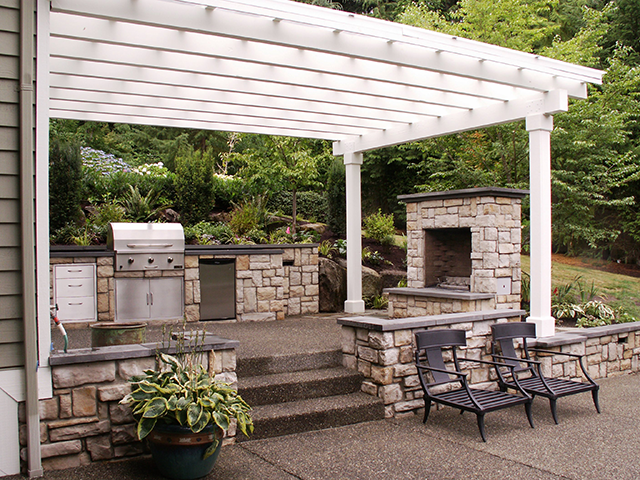 They can also assist you in finding the best installer for your outdoor kitchen.